Who's prepared to step up to the plate? No one single provider can claim to have impacted the world of BPO with such verve and focus over the last five years, than that of Genpact. During the “boom” years of Finance and Accounting BPO adoption, between 2005 and 2008, the Gurgaon-headquartered firm aggressively pursued nearly every large deal on the table, with a no-nonsense approach of lift-shift-transform BPO at aggressive pricing, bolstered by the GE Six-sigma and LEAN heritage and branding. However, the mindset-shifts of the Recession, combined with a more knowledgeable buyer, more credible competitors, and the ability of several Indian-headquartered and Western providers to compete more aggressively on price, have conspired to create a much more challenging environment for any provider competing for BPO business. Most importantly, serious questions are now being asked of the leading service providers jostling for marketshare and position in the BPO business. Some providers are growing frustrated, and beginning to question whether they got their approach to BPO right. And the current speculation over Genpact ‘s future is forcing many of the BPO wannabes to gaze deeply into their navels to decide whether they want to get really serious about BPO. There's been a lot of chest-beating, a lot of marketing, a lot of huff and puff right across the industry... now's the time to see who's really going to step it up. Our view at HfS Research is that if any of the emerging service providers want to have a billion-dollar-plus BPO business that touches all industries, horizontal processes and provides a platform for that next phase of growth, once the low-hanging IT projects start to dry-up, they need to decide whether they have the appetite to swap-out a sizeable portion of their stock to acquire Genpact. Because if they don’t, another party eventually will, and there aren’t too many billion-dollar BPO firms left which will provide instant top-tier status and massive BPO global scale. And if that acquirer doesn’t come from the sub-continent, if could well eventually come from a Japanese, European, or a Western business. Recent BPO market entrants are primarily IT services providers, which focus on rapid “penetrate and radiate” strategies. They are approaching BPO with the same strategy, and finding it much more resource-intensive, slower-going and lower-margin work. The leading offshore IT providers are quickly realizing BPO’s a very different ball-game and may be forced into making a much larger investment than they ever intended, if they want to develop any BPO business of significant scale. With the exception of a few transactional-based processes such as invoice and payables processing, order management, indirect procurement, the growth in future BPO areas is dependent on talent that can’t be picked up a en-masse from University training programs, or from infiltrating the campuses of neighboring lower-tier competitors with drive-by recruiting sweeps. With much of today’s BPO engagements, providers are creeping from 5 to10 to 15 to 20 staff in their clients… it’s at a completely different pace and scale, as the requirements are often more customized, more specific and it’s simply harder to find, train and retain the talent they need. They are simply not finding anything like the margins and growth that their IT business have enjoyed over the years. However, if they want to have a shot at winning the larger-scale engagements today, they will simply finding themselves running out of time to get a foothold in that game, if they persist with a “penetrate and radiate really slowly” strategy. The Bottom-line: There aren’t many entry points left to get into the top-rung of the BPO business. 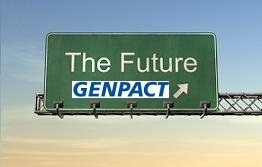 Genpact may well be the last lever to pull. All the leading providers have, or claim to have, both horizontal and vertical BPO capability. They know that having deep processing competency is incredibly “sticky” for growing deeper client footprints, and can help them develop institutional knowledge and comfort with clients, to remain with them for many years to come. However, gaining BPO competency and scale isn’t like IT – there simply aren’t the hoards of dying European and tier 2 providers eager to get picked up. There’s really only Genpact left standing at the top-end, Xchanging and WNS in the mid-tier, and EXL, OPI and a few select others as the only really viable pureplays that will give an immediate leg-up in terms of immediate BPO scale and competency. Moreover, the old “let’s hang around and pick up a juicy captive” won’t wash anymore. Everyone’s run the rule-book over all of these, and there aren’t many worth considering, that make a lot of financial sense or provide suitable client scalability. So this brings us back to price-tags and sensible investments. There haven’t been many past BPO investments that have been very successful – all have involved painful transition and slower-than-expected business growth - a fact that has put off a lot of firms making aggressive acquisitive BPO plays in recent years. However, Genpact is another proposition entirely. It has massive BPO footprints across many major enterprise clients. It has global scale, industry competency and a good operational track record with clients. It really does represent one of the last major entry points for ambitious providers to make a “big bang” play into the BPO space. The big question we ask now is – who has the appetite, and who is serious enough about this business, to make it. Well pricing flexibility amongst plunging dollars & Euros is apt to cause these mega players to respond. The jury is still out on how. It mostly will result in corner cutting, despite SixSigma backdrops, and in some cases staff funding compromises which from a social economic perspective will not help any country (established or not). This then leaves the looming question whether to accept and adapt appropriately or to retro-source which few buyers have anticipated or planned for. You said: "And if that acquirer doesn’t come from the sub-continent, if could well eventually come from a Japanese, European, or a Western business." I wouldn't discount the possibility of a Chinese acquisition, seeing that the Chinese government has decidedly set BPO growth in its sights (see list item 5 at http://rightsite.asia/en/article/5-reasons-china-will-dominate-business-process-outsourcing). @Lucky: Agree that this is a possibility, however we are yet to see any major Chinese-based investments in non-Chinese ITO / BPO providers. I would put my money on that investment - when it comes - to be in the IT arena, not BPO. @David: we'll have to agree to violently disagree here! Firstly, IBM already competes very aggressively with Genpact for exactly the same type of BPO engagements - and is very much in that market. "Cheap hands" must be managed as "clever hands" if you want to build and deliver over a billion+ in annual BPO revenues. The days of low-cost body-shopping are becoming more distant in today's market. Phil - a very interesting and insightful piece. An organisation which may be regarded as technology light Against this background maybe the owners recognise that G have too few "clever" hands or they lack faith in the ability of the existing top management team to take it any further. As David says G do have some startling gaps in their client base in Europe with limited penetration in banking, insurance, retail and utilities. This begs a couple of questions: a. Have they left it too late to make any headway in these industries? b. Has the European leadership team relied too heavily of F&A at the expense of other areas? c. Who will replace the CEO? d. What is the exit plan for the owners? Phil For clarity who are you including under second tier BPO providers as everyone seems to have a different opinion here. For me the simple point is that those with the money have no need and those with a need have not enough money. And again, regardless of who buys, what exactly are you getting for your money? Simpy a seat at the table. IfI was an Exec I would be looking to grow my own business, learning as I go, and investing in my people and thinking rather than risking my money on a throw of the dice with an aquisition which may not work and destory rather than add value to my organisation. Far more attractive to me as a client is an organisation which spends its investment dollars on building a capability hand in hand with me and learns with me rather than one which simply wishes to race to the top. Slowly slowly catchy monkey. Phil, while the notion of buying Genpact is a solid one, as a client who has leveraged Genpact in the past as a GE executive and now in a different avatar, I will say this - you need to go beneath the covers on their financials. GE and all its divested businesses still give them about 60% of their revenues (unlike the 40% odd they report because they don't show them as GE entities any longer because of the divestment) at a healthy 55% gross margin which would mean that the rest of the business that they have from what they call as Global Clients is coming at a loss or negligible margins to ensure their reported average gross margin of approximately 35-37%. This to me means that they have been acquiring businesses at dirt cheap prices to gain market share and reduce their dependence on GE. However, longer term, those businesses will come to haunt them as they look to make money on the same. All BPO providers have had take on business at less than favorable price-points that is optimum for them (which is why several of the IT services firms are struggling with the whole BPO proposition - it's just too hard and the margins often not as attractive). However, it's also proven that it's tougher to swap-out process such as accounting work and move to other providers, than most IT work (we've barely seen any client defections in F&A). Simpy put, F&A BPO is incredibly "sticky" and allows for the provider to get their margins better-balanced in time, especially as their deliver models mature and they can work with their clients to deliver the work more effectively. Moreover, introducing better IT-enablement of BPO work is really helping in many cases. So, while G may have been guilty of under-pricing a few contracts in its growth years, so has everybody else, and you can bet your botton dollar, some of its competitors would love to get their hands on some of that corporate "real-estate" a large F&A contract brings! @ James - agreed. Buying Genpact would automatically vest a seat at the BPO services table simply by virtue of having BPO scale. For those non trasactional/utility business functions they remain a non starter, over and above voice and F&A work, unless domain expertise is evident. It's partly due to these two points, that I disagree with the assumption that cloud and utility BPO services will drive significant new business. A Genpact acquisition will garner a boost to revenue, if clients can be retained, however it will not provide a platform for signifianct expansion for more developed BPO needs. IMHO. Phil, interesting piece. BPO does lend itself to organic growth, but not at the same rate of increase as you would see in IT circles. Often, many large enterprise clients manage a number of select vendors based on a hedging their dependency and playing them against one another in order to squeeze every bit of productivity out in the bargain. The challenge is two-fold. I think the real opportunity to advance BPO is to demonstrate the synergies available to the client if they were to enable the supplier to graduate towards a BPO + IT model (not necessarily a platform play, although this can be an option). Most suppliers are risk averse to take bold steps to introduce both sets of competencies i.e. Technological innovation paired with Operational/Tactical capabilities. These are inextricably linked. The future of BPO depends on the apetite of the players in the market.